The Pilgrim’s Progress is one of the most popular books of all time, and one of the most important stories of the Christian faith. Second only to the Bible in total copies and translations, the story was written by John Bunyan, a Puritan preacher in England who was imprisoned for holding unauthorized religious meetings. The Pilgrim’s Progress is a powerful allegory that helps us to see the spiritual quest as the most important journey in life, as well as the importance of staying on the right path, even when the journey gets difficult or when others try to lead you astray. The Pilgrim’s Progress has been recently made into an animated film for the whole family to enjoy – and it’s coming to theaters just in time for Easter, for two days only! Most previous attempts to turn The Pilgrim’s Progress into a movie were rather disappointing. Although I LOVE the live-action musical from 2017! It was produced by Rogue Valley Fellowship in Oregon with a budget of $2500 and a volunteer cast and crew, using the awesome backdrop of the Cascade Mountain Range to their advantage. The worship pastor (Jeremy Oliveria) had the starring role as Christian (boy, can he act and sing – AND he composed the score!). Some members of the Oregon Shakespeare Festival also played a part. The dialogue was spoken in rhyme, and if this all sounds a bit corny, it’s not! The scenes, the songs, and even the special effects were great. With that in mind, I must admit, I wasn’t too excited about the animated adaptation of The Pilgrim’s Progress. After viewing the trailer, my first thoughts were that it looked somewhat juvenile and cartoonish. But boy was I wrong! It’s actually really well done, I’m impressed. They did a great job of recreating the characters and creating conflict. True to the book, the movie is about Christian heading to the Celestial City where Jesus is King, and how he overcomes the demonic powers trying to stop him. For an animated movie, I wasn’t expecting it to be so dark! I like how they included an evil twist, à la The Screwtape Letters, with the demons trying to manipulate things behind the scenes. And Apollyon! He looks a lot like the the Balrog from The Lord of the Rings, or a demon right out of the classic Doom computer game. Very scary! For that reason I would say this movie may be a little too frightening for some younger children, but you will have to be the judge depending on how sensitive your child is. The scariness makes the story more effective, that’s for sure. I’m still waiting for an epic, large budget cinematic version of The Pilgrim’s Progress reminiscent of Peter Jackson’s success with The Lord of the Rings. But for now, this one is pretty good! Although the CGI character movements aren’t Pixar quality, the beautifully detailed backgrounds certainly are. The artwork is gorgeous, and the natural scenery is photorealistic. I know in most cases you should preferably read the book first, but if you haven’t already read The Pilgrim’s Progress (or if you tried to but didn’t get all the way through it), this movie serves as a nice introduction. It will not only inspire you to read the book, but since the movie remains faithful to the written work, watching it will help you to better follow along with the story and understand what’s going on. 2 days only! April 18 & 20, Easter weekend! Invite a friend or bring a group! This giveaway is easy to enter for a chance to win! 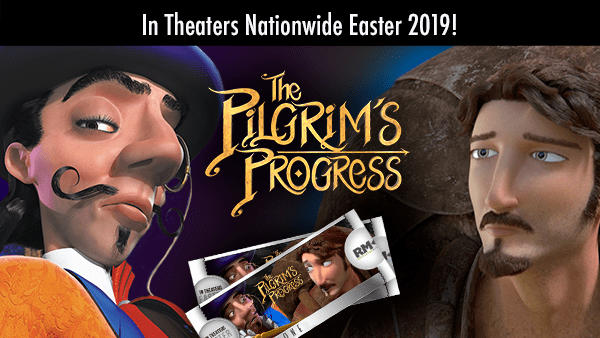 The first 3 people to leave a comment on this post will each receive a pair of tickets to see The Pilgrim’s Progress in theaters on 4/18/19 or 4/20/19. Note: only US-based giveaway winners are eligible for the Fandango movie tickets due to Fandango limitations in Canada and outside the US. CONTEST RULES: Only U.S. residents may enter. One entry per household and IP address. If you have won the same prize on another blog, you are not eligible to win it again. Sorry, but “professional” giveaway players are automatically disqualified. Winner is subject to eligibility verification. Winner will have **48 hours** to respond to an email. If one winner is deemed ineligible or fails to respond in 48 hours, another winner will be chosen. No purchase necessary. Contest winner(s) will have their movie ticket discount codes emailed to them ahead of the theatrical release date. Homeschooling Teen is not responsible for lost or misplaced prizes. By entering the contest, you agree to the giveaway terms. P.S. It may take a while for your comment to appear after you post it. What a great movie to see for Easter!